I've created this blog because of the new found history to me and about me, but I'll throw in some things about quilting or books I particularly liked and perhaps even family, my favorite. For continuity of my history, start from the earliest entry to the most recent. 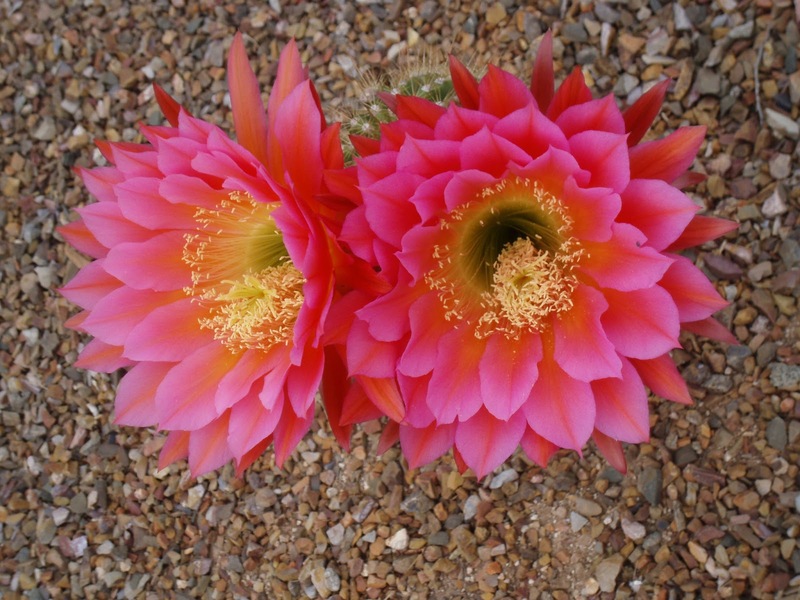 I was just visiting another site and saw some lovely photos that I wanted to see enlarged. Then I read, off on a side bar, that clicking on the photo will enlarge it. So I came to my blog and tried it, too. It works! So, just in case there is someone else that isn't in the know, just click on any photo and there it is ... bigger than you knew was possible. Enjoy! Chuck had not been feeling up to par, but was not sickly. He had complaints of back pain, being tired, shortness of breath ... all being properly looked at by doctors as the symptoms presented. In September 2014 he had some rectal bleeding and all kinds of extensive scopes, but the bleeding stopped 0n it's own ... after 6 units of blood ... and they could not find the source. Diverticulitis was the suggested diagnosis & he was sent home with diet restrictions, which he followed. Jan. 18 he was back in the hospital with another bleed, they scoped & after 2 days found the source, but when they tried to clamp it they saw something was not normal, did a superficial clamping, then a CT scan or MRI or both and saw there was metastasized cancer and it was beyond help. The doctor told us to get our affairs in order and luckily we had done all that over the years and knew what we wanted. Colleen was with Chuck the night she arrived quite late and he told her his wishes. He wanted Bill Pegg (former minister and friend) to do the service, no Amazing Grace sung and his ashes scattered from a hot air balloon and where he suggested memorials to go. Chuck knew it was serious and that he was loved. The whole family was with us and his friends came for short visits and to say goodbye. He asked me if I would be OK & when I told him I would be, not like it, but OK, he accepted his fate. He was in good spirits until the end and made us all laugh with him often those last days. When hospice was mentioned he asked where ... home or perhaps across the street from the hospital is a wonderful facility, he was told. He said St. Anne's ... "Just wrap me in some of Claire's quilts (winter was beginning in full force ... hasn't stopped yet either), put me in a wheel chair & wheel me across the street. No sense in paying for an ambulance for THAT short distance." We all laughed right along with Chuck. He could not wake up on the 24th, was taken to Leo's Center For Caring ... in an ambulance ... and died peacefully on the 26th. It was a blessing ... not easy on us, but it is made so much easier because of Chuck's sense of relief that his not feeling up to par had a reason and was not just in his head. He was in no pain. The calling hours and service were full and even though there was sorrow they were not sad occasions. I'm going to include my son-in-laws loving eulogy, which captured Chuck completely. Thank you all for coming to celebrate the life of Charles Samuel Welch. My name is Richard Davisson and I am have been married to Colleen for more than 30 years which means we only have about a quarter century to go to match Chuck and Claire marriage. I will be reading from my notes to keep from blubbering which is a trait I share with my father-in-law. I will keep this mostly irreverent because Chuckie loved to laugh and it also helps to keep me from blubbering. So in keeping with this I need to tell you all this right now: I not wearing my good suit because our cats peed on it. Chuckie would love knowing that. Mr. Welch I said– “Call me Chuck”, ah, yes sir – “call me Chuck”, ah ookay… “ I love your wife… I mean your daughter and I would like to ask for her hand in marriage.” Through his wire frame glasses and without pausing to consider my question he immediately answered, “Why are you asking me?” I don’t honestly remember anything more of the conversation but years later I came to realize that what he meant was “Son, I love my daughter and I trust her judgment. So you need to be talking to her. For my part, if you promise to love and respect her, care for her, protect her and provide for her then you have my blessing”. That was Chuckie. He was a man of many words when talk was cheap, few when they were important. The golden years for him being when Bill Pegg led this congregation. Bill Lanigan told me a story last night about a time they were ushering when two elderly ladies broke into a heated argument over who had the right to sit in a certain pew. Chuck interceded and the result: They both turned on him and stormed out of the church! Chuck stood there, mouth agape until Bill came over and told him to find Claire and get a hug. When he was moved to hospice Monday the staff at St. Anne’s saw that he had been a war veteran. They presented him with a beautiful poem thanking him for his service and an American flag blanket. A few hours before he passed he rallied, woke from his sleep and the nurse had a chance to share this with him. Satisfied, he fell back to sleep knowing that we all appreciate his duty to country and his sacrifice for our freedom. Who knew that he would love both grocery stores and hot air balloons? How do they even go together? There was a dark side to Chuck – he had enemies to be sure. And of course I’m talking about his arch rival: the sycamore tree in his yard. That battle raged on long before I knew him. “Twigs and roots. Those are dirtiest damn trees!”. That was the battle cry that I would hear every spring. I think he secretly loved winter because it covered the roots that were popping up in his lawn. Chuck loved sports and was loyal to his teams. But I think he chose his teams based on their ability to beat Syracuse and Notre Dame. And that was the real sport in his life: Finding someone who he thought should love SU or ND and rubbing their nose in a loss. It didn’t really matter to Chuck if they actually cared about those teams – he just loved a good argument. When Chuck and Claire retired we were all concerned that they would have nothing to do. Wow were we off base! In addition to being a volunteer driver for the Red Cross, he helped out with many church functions here, was the assistant play by play for the high school, he and Jeff were ardent lacrosse fans, they made regular pilgrimages to Detroit and Connecticut and Florida and Arizona and traveled extensively. We always had to schedule our family visits well ahead of time to be able to squeeze in between Elderhostels, now called Road Scholar. I feel I’ve visited most of the globe vicariously through his verbal and pictorial travelogue – the pictures of exotic locations and the detailed descriptions of perfect strangers that they met and befriended. Everyone had a story – EVERYONE… But if we were less than interested in the details, his enthusiasm was infectious none-the-less. He really loved people and went out of his way to get to know them. There were no strangers in Chuck’s world just friends he had yet to meet. Chuck touched so many lives in so many ways. You may have noticed one of the bouquets were from his favorite bagel shop near their house. Every day for the last forty years he would get up, go to the bagel store and order one bagel. I’m not sure he liked bagel all that much but I’m sure he loved to kibitz with the folks there. He called me “Dickie”. Nobody calls me “Dickie”! I called him Chuckie or Grandpa but I really knew him as “Dad” because he certainly was to me. He was so proud of his grandkids. He hated hockey but loved to come to see my kids play. I don’t think he ever forgave me for me hating golf but I was redeemed to some degree when I gave him a grandson that played. Colleen and I gave him blondes, Paul and Lisa gave him brunettes. Cindy and Charlie gave him dogs. And he loved them all equally. He was Facebook before there was such a thing. We would hear about Charlie’s workshop, Cindy’s latest quilts, and Paul’s love of St. John. He would go into great detail about Lisa’s latest job. Of course he had absolutely no idea what it was she was actually doing but “you know Lisa, it has to be important”. Patience is a virtue we are told. But of all the virtues that Chuck possessed this wasn’t on the bottom of the list, it never made the list. For those of us who knew him, loved him, were touched by him, to heck with patience. Chuckie made haste a virtue. Isn’t that EXACTLY Charles Samuel Welch! Last night, before I went to bed, I vowed I'd go right to the sewing room and finish the comfort quilt after breakfast. I figured it was a good substitute since quilt club was canceled due to the snow, blizzard and our speakers' inability to fly in. And this blog may seem familiar as I wrote about distraction on Nov. 4, 2011. I found it in my ramblings today. So, this morning I decided to check my email first and received one from Ulla who is working on publishing Opa's memoirs and history about us Weinberg's. She had several questions about my uncle and so what did I do? I tried to looked them up, which took quite some time, and then wrote an answer. While looking them up I got carried away and was reading my Germany blog entries. It has distracted me all morning; not that it was unpleasant. Actually it was fun. But this is why I don't accomplish my goals in a timely fashion. Now it's 3 PM and I'm going to work on it now. With luck, I'll get the hang of this machine quilting thing. I do straight lines very well, but I sure need practice on curvy stuff. I'm practicing on a comfort (gift to charity) quilt. I was in my sewing room and saw ... not a relaxing place to work, but a mess! So I decided to finish a few things and put others away. As I'm doing this I noticed how dark the basement room is so this spring (if spring ever gets here) I plan on painting the room, one wall at a time. So the UFO's must get done! (UFO's = UnFinished Objects) But what happens? I hear about a class or someone has an occasion and I feel compelled to construct something ... or is it what I'd rather do than what needs to be done? I did get 3 things done. Can't show one of them because it hasn't been gifted, yet. The other 2 are because Janet Root offered a Mystery Wall Hanging workshop that sounded appealing. Janet told us what values and size fabrics to bring from light to dark. I brought 3 separate piles. It's SO difficult to choose when you haven't seen a sample, but I love the challenge. This is my finished class piece. Chuck & I liked the outcome, but when we were in Tucson last winter I found some quilt shops and felt obligated to support them. I found some AZ fabrics, but didn't take to Janet's class exactly the correct fabrics with me in that pile to showcase it. So I made another one, almost the same, using those fabrics and ignoring all the other UFO's waiting to be done. Here is the result. And these were requested gifts. Colleen's is made of Downton Abbey fabrics (they have a cat named Downton Tabby). Maggie requested some ruffles. And the one I made for Liz were to her specifications, too. I also have a comfort quilt almost complete. The quilt for our bed is going very slowly. It took me a long time to figure out why. When I started it, 3 - 4 years ago (Chuck says he'll be dead before it gets done), I decided to hand quilt it as it has wonderful open spaces for that and I LOVE hand quilting. Make that "loved". I have arthritis in my fingers that are now making hand quilting uncomfortable. So this WILL be done in 2014. I will finish hand quilting this section and then switch to machine quilting the border. The poor quilt on our bed is getting thread bare and needs a permanent rest. Now that I know the problem, I'll take a mild pain reliever before I hand quilt. I've also figured out that the quilting is not as visible with busy printed fabrics so machine quilting works fine. The comfort quilt is where I'll practice some "fancy" machine quilting. Then when I do another quilted project that calls for decorative quilting, I won't be quite so intimidated. I keep hearing ... practice, practice, practice. But first, making the sewing space a pleasant place to work. This time it was our turn to host New Year's Eve. We have been getting together for over 40 years with our friends. Some have moved away and some are no longer with us, but we are still together. When our children come home we reminisce about all the good times together, but New Year's eve was just the adults. We decided to get together in our homes because we lived close to each other and had small children and didn't want to travel far, but did want to celebrate together. It was before cell phones … come to think of it, we all have cell phones now, but most of us forget to turn them on and we do not have smart phones. The parties were easy and fun because we shared the food preparation. The hosts had to come up with some entertainment. Easy! Now I'm 79 and I dreaded the upcoming party. Why? The entertainment! We love getting together, but we can't just sit around and look at each other until midnight. Finally I just took the bull by the horns. I got together a couple of activities (count all the nativity sets and snowmen I have) and another that I'll explain later. First we snacked on appetizers and talked, then the activities … oh, dear, it was only 10:15 … almost 2 hours yet to go, but as I'm pondering what to do next I noticed that everyone is engaged in conversation and enjoying each other. So I relaxed. Someone suggested we have our dessert before midnight. Perfect. Because I was agonizing about the upcoming party, I realized how lazy or unmotivated I've become. And I've heard some of the others doing a little of the same kind of grumbling. It's seemed like such an effort. We do love getting together. I've known since Jan. 1, 2013 that it was my turn. Then about the first week in Dec. I had a change in attitude and wondered why? I had (still have?) bursitis in my hip and for over a year have been hurting. Medicine and cortisone did not help so I've gone for extensive physical therapy. And it worked! I am pain free (hope it lasts), have energy and am happier. Pain takes a lot out of you I've come to realize. I also realized I don't have any fulfilling goals. Yes I have a bucket list, but that's not the same, but it may be enough at this stage of my life. So I asked everyone to list some goals … and that got the discussion started. It wasn't easy because we have new challenges to deal with, but I think it helped. It did for me. And that's what friends are for, to support each other. I forgot to take pictures of us, but here is a fairly recent one. So what is my goal? I really hate to exercise, but must do it in order to stay healthy. Maplewood "Y" has a wonderful instructor for seniors and I'm going to try to go regularly. Anja is very attuned to our individual needs and helps us when we need it. I'll work on other goals. Good luck with yours. Not feeling up to par ... nothing serious or life threatening, but I've lost my voice and have a little sore throat. Chuck should be happy, but he finds this amusing. I'll give you 1 example. This morning I had peanut butter on my toast. The toast was warm and a little peanut butter dripped on my shirt. Since I'm not feeling well and we don't expect any visitors today I did a poor job of cleaning my shirt. I'll "Shout" it tonight. When Chuck noticed it he pointed to it with a questioning look. I didn't respond so he did it again, only getting that pointer finger closer. Again, no response from me. When he did it again I gently shoved his hand away and gave him a dirty look. That's when he SPOKE, "What happened to your shirt?" Then I told him, although all my words were not clear. Why is it when I have voice problems people don't talk? Their voice is fine! OK. I feel better now. Thanks for listening. About 30 or so years ago someone gave me or I purchased at a church bazaar, a cactus called "Donkey Tail" and it has grown. Little pieces fell off and I've started new plants to give away or have them languish in different parts of the house. It never flowered. About 20 years ago I was walking by a store front office that had one in the window with it's long tails draped on the bay window sill. It had flowers on the tails! I'm sure on occasion it was blown on to clear away some of the dust away. This last year the poor thing thrived on neglect. It grew and I let it. I think I didn't water it for 2 months. Last week I looked at it ... to cut the long strands ... and it had flowers on it! Needless to say, I did not cut it, but did blow the dust bunnies away. When the flowers are gone I will cut it, but for now I'll enjoy the small red flowers. 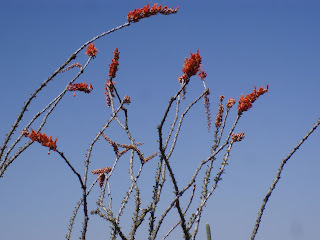 I think the cactus was so dry it probably thought it should reproduce! Of course, I left the plant to grow and there were lots of dust bunnies around it, because I usually have a table in front of it, but we had company and I pulled the table out, so I HAD to get rid of the dust ... and I gave it a drink! Yes, it was worth the wait. 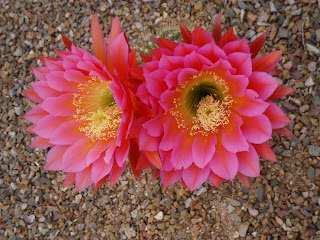 It reminded me of our last 2 weeks in AZ when the cactus bloomed. It was glorious! 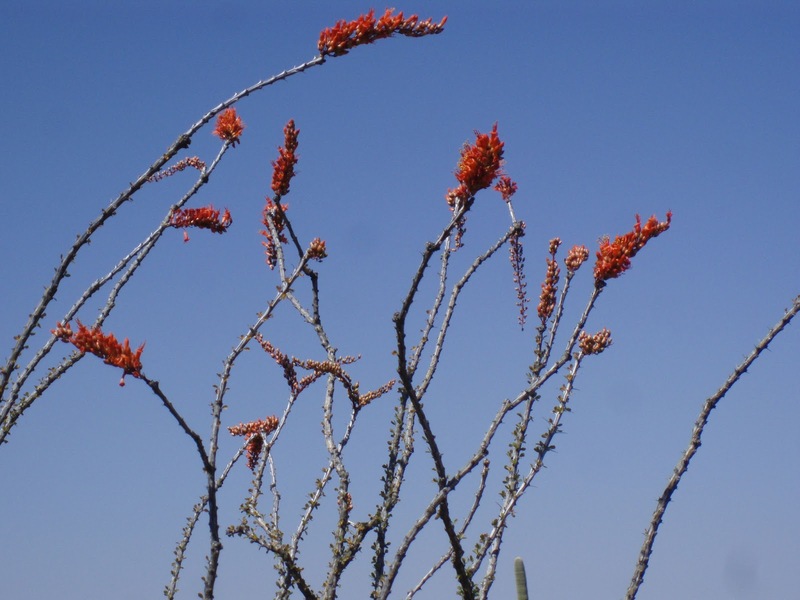 These ocotilla are usually brown sticks, but with the rain, followed by the days of warm weather, they flowered. We got home from Tucson and have had a time unpacking. When the suitcases were empty, the things we had shipped arrived. Why did we have so much stuff to send home? When Pat, my sister-in-law died, my brother asked me if I'd like her shoes. They fit! So I accepted his offer. Love the shoes and think fondly of her each time I put a pair on. Chuck calls me Imelda Marcos, but I'm not that bad. Anyway, back to the LOST. When Bob Myer called me in July, one question he asked me was who did my mother pay to get Dad out of the concentration camp? I had no idea. Bob said he remembers his mother having trouble scraping together the money. That would not have been a problem for us. It was another unanswered puzzle piece for us to ponder. 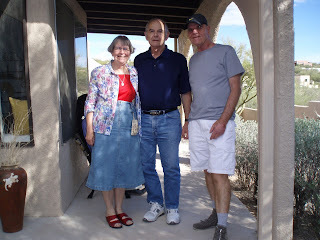 On March 30, Bob came to Tucson for our last visit until we meet again. Bernd dug out all the books and documentation he had for Bob to browse. And Bob browsed. In Jan. 2010 I met Renate Neuman and since then I have read the published and translated book which was the journal that Renate's mother kept. Bernd also had this book and it was one that Bob was browsing through. There on page 25 Bob glanced and saw a reference to "the German Escape Tax". Renate's family did not pay it so could not leave legally. We (Meyers and Weinbergs) must have paid it as we left legally. So Bob's question was answered. His mother paid the German Escape Tax. This is another piece of our history puzzle that we are finding out about. It has reminded me to keep a record of all I find, since I can't ask my now deceased family. I know I have spelled "Meyer" and "Myer" and they are both correct. In Germany it was "Meyer". And another question Bob asked was how we are related. 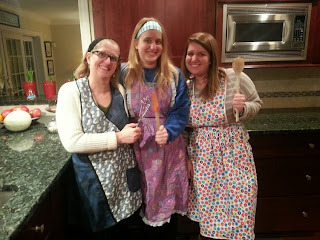 I have a genealogy program, Reunion, and saw that our grandmothers were sisters. Now I'm almost finished adding information about our family. Corrections and photos have been added. Just a few missing pieces and I can share it with the family, not sure if they are all interested, but if they save it, it will be there. They don't all have to start when they are in their 60's and 70's like I did. It is fun ... and time consuming. Until we meet again ... sounds like a song to me.